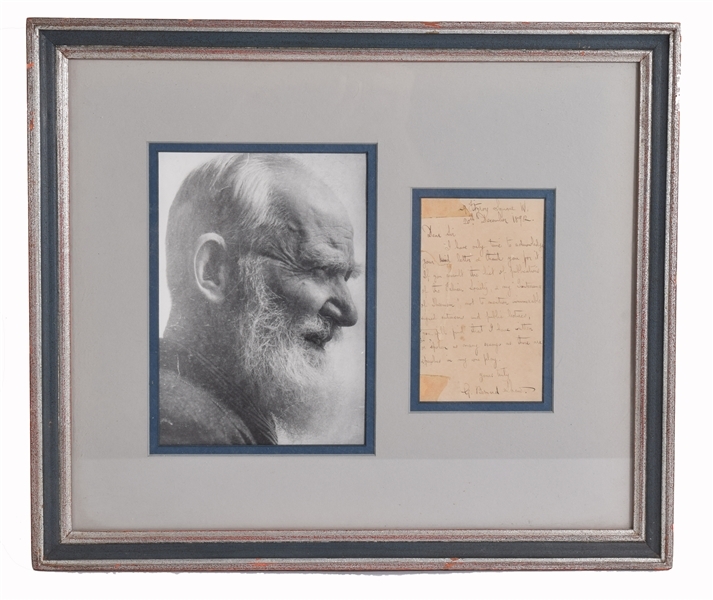 George Bernard Shaw (1856-1950), hand written postcard to person in Brighton, address is shown through open window in framing not inspected outside of frame.Does look to be in fair condition.. Interesting thank you letter where someone is asking him about his writings. Shaw replies in part"you will find that I have written or spoken as many essays as there are speeches in my one man play." George Bernard Shaw (26 July 1856 – 2 November 1950), known at his insistence simply as Bernard Shaw, was an Irish playwright, critic, polemicist and political activist. With a range incorporating both contemporary satire and historical allegory, Shaw became the leading dramatist of his generation, and in 1925 was awarded the Nobel Prize in Literature.